I can no longer claim to be a baker who knows nothing about cooking. Ever since delving into the world of line cook-ery, I've felt inspired to cook more intricate meals at home. As my creativity in the savory side of the food world slowly expands, stuffed peppers have quickly become a staple in our household. It's true, I can't seem to step away from the oven. It's my comfort zone! 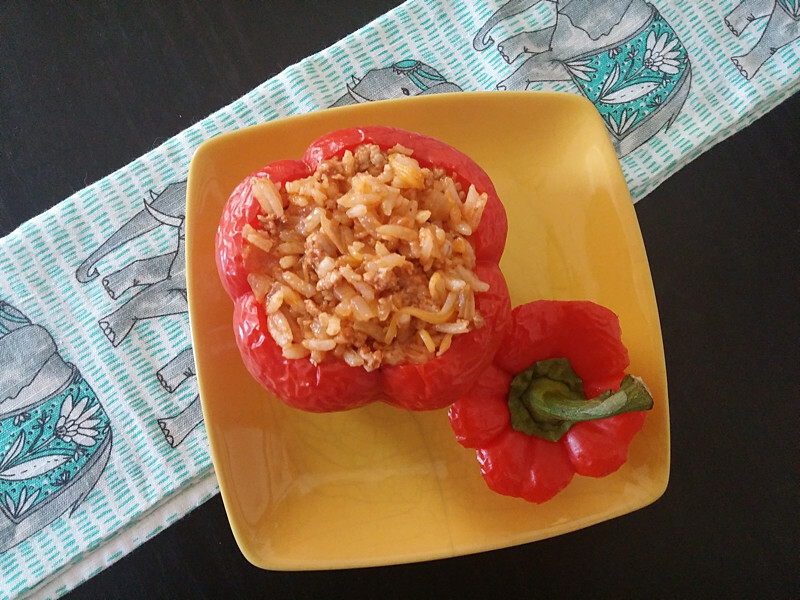 Stuffed peppers are great because they make it easy to feed a group of people, with minimal effort. While our "group" is usually just the two of us, that just means that we get to be creative with leftovers. The filling reheats super well and we've used it as taco filling, meat sauce with more rice or with pasta, or just on its own for a quick bite around lunchtime. I actually made the poblano crema to go alongside some fried fish tacos I made last week, but I made so much of it that we've been enjoying it with all of our dinners. Of course, I forgot to garnish these peppers before taking a photo because I made the peppers in the afternoon in preparation for dinner, so I took photos after stuffing them but then refrigerated them until later in the evening when they would actually be consumed. Hence, naked peppers. But, regardless of the missing photographic evidence, make the poblano crema!!! Trust me, it's delicious. - Preheat the oven to 500 degrees. Once the oven reaches 500 degrees, roast the bell peppers and poblano pepper with a drizzle of olive oil and a pinch of salt and pepper. Roast them just until the skin starts to darken and peel, about 20 minutes. Turn the oven down to 400 degrees and set the peppers aside to cool. - While the oven is preheating, mince the garlic and dice the onion. Heat a little olive oil in large frying pan and cook the garlic and onion until soft and almost translucent. Stir in the tomato paste and cumin. Then, add the ground turkey, stirring occasionally until cooked through. - Once the turkey is cooked, turn off the heat and season with salt and pepper to taste. Add the rice and water and stir until everything is combined. Then stir in the cheese. 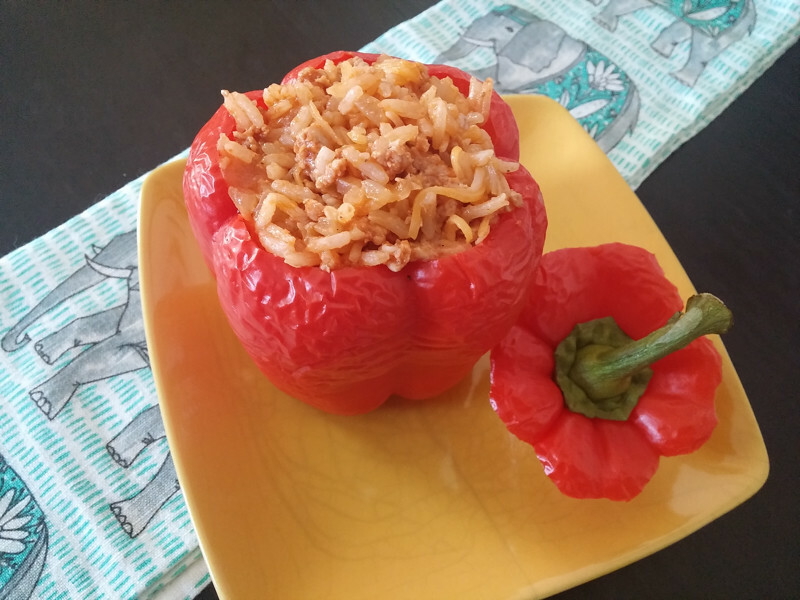 - Use a paring knife to core the bell peppers. Cut an opening around the stem and remove the seeds inside the pepper. 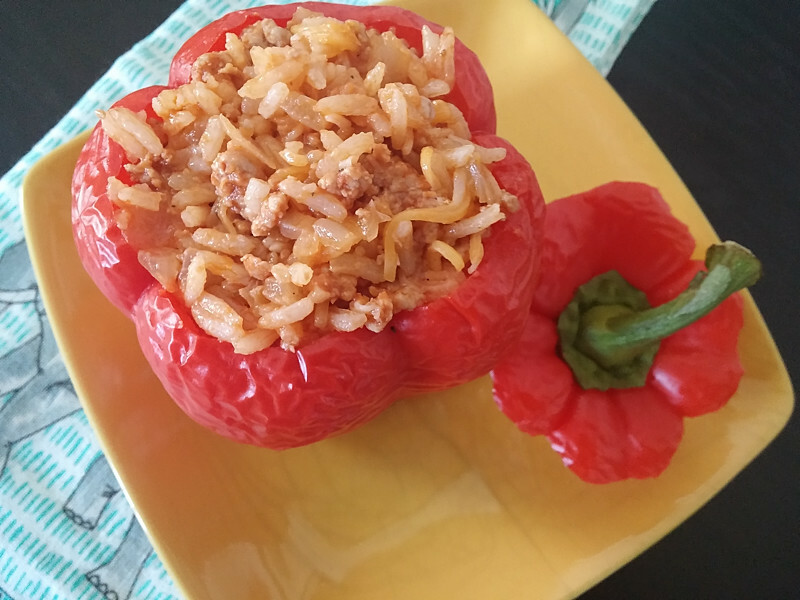 Use a spoon to fill the peppers with the turkey and rice filling, making sure to pack as much filling in as you can. Top with additional cheese, if desired. Put the stuffed peppers back in the oven for 15 minutes. - While the peppers are baking, make the poblano crema. (You'll need a food processor for this.) Remove the core and seeds from the roasted poblano pepper. Chop the poblano into large chunks to help the food processor break it down more easily. Add the sour cream, mayonnaise, and juice of one lime to the food processor and run until the pepper is completely broken down. Add more lime juice if the consistency is too thick. - When the stuffed peppers are done baking, place each one on a plate, top with poblano crema and a sprinkling of chopped cilantro, and enjoy!